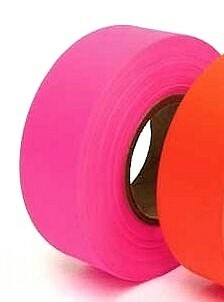 PRODUCT: PINK GLOW COLOR FLAGGING / SURVEYORS TAPE, 1-3/16" X 150' ROLLS. 144 ROLLS/CASE PRICE/CASE. DESCRIPTION: GENERAL PURPOSE FLAGGING/TAGGING TAPE. UNIQUE TEXTURE AND MATERIALS ENABLES EASE OF TYING AND STRETCH FOR EASE OF USE YET DURABILITY (not an adhesive tape). MADE OF FLEXIBLE PVC. OPTIONS: Also available in Orange Glow, Pink Glow and other standard colors (red, white, orange, blue, yellow and green).